DESIGNER WEEKENDS: UUPCYCLE LIGHT BULBS! Turn light bulbs into ornaments! Find instructions and supplies on Crafts Direct. 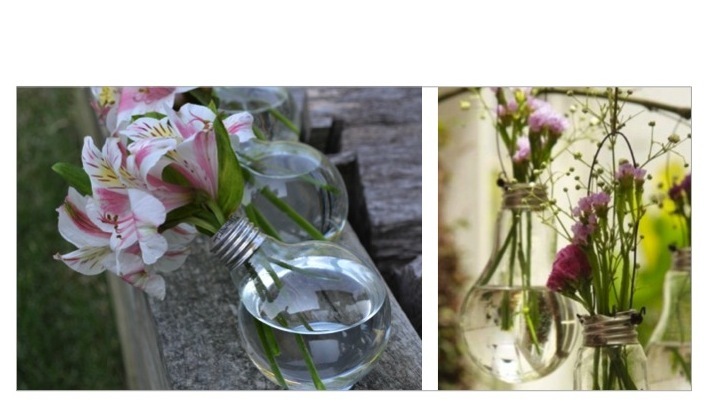 We love the idea of creating a dining table centerpiece or window art out of light bulb vases! Try them with sprigs of fresh herbs so they smell great too! Learn how to make your own vases from Savvy Housekeeping. How cool are these light bulb oil lamps? We love them in place of candles, anywhere in your home! Homemade Serenity gives instructions on how to make your own. Please vote for us - Top 100 Design Blogs! Thank you!